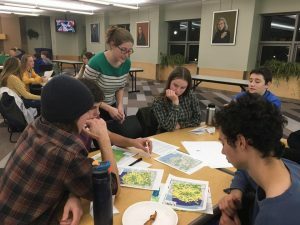 On November 10, the VTeen 4-H Science Pathways Café welcomed Dr. Jen Santoro, a postdoctoral fellow at the University of Vermont Rubenstein School of Environment and Natural Resources, to speak about geographic information systems (GIS) and maps. Santoro is currently working in the Silviculture & Applied Forest Ecology Lab and studying the regional impacts of climate change, invasive species, and disturbance of northern New England forests. We were lucky to see how she uses maps in her research and how useful they can be in our everyday lives. We began with a discussion of the kinds of maps we use on a regular basis, including weather radar, GPS systems, and building floor plans. Then, we each drew a map of a place we love and compared them in small groups. This was a great way to get to know each other and interact at the café. Next, Jen spoke about the use of maps as effective tools of communication. For example, reading a list of Vermont counties and their populations isn’t as easy to understand as a map of Vermont counties color-coded by population. The map offers faster analysis and a visualization of geographic relationships, which the list is more precise but also more cumbersome. 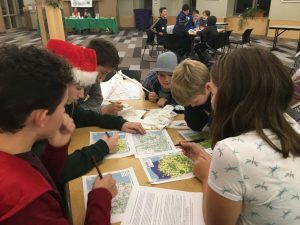 Jen then talked about her own work, using maps to monitor the damage from forest fires and the spread of the emerald ash borer, an invasive insect, in New England. Jen had prepared two interesting case studies for us to investigate. They both demonstrated the use of maps in policy decisions. One case study dealt with selecting a new site for housing development in Charlotte, Vermont. Each group was given five different maps of Charlotte indicating contour, types of land cover, and locations of bodies of water, schools, roads, and other amenities. The goal was to select five potential sites for new housing development using the maps and criteria given. The second scenario, which I worked on with my group, was the selection of a new site for an American Chestnut tree orchard in Groton State Forest, Vermont. 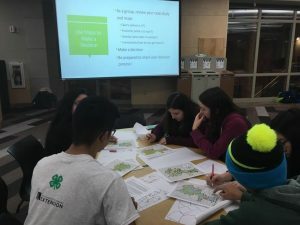 Our task was to use five maps, which gave information about forest type, soil type, slope, and trail and stream location in Groton State Forest, to select five potential sites for a new orchard. We were given that the orchard should be close to a road or trail and that chestnut trees grow best in Northern Hardwood forests, on sandy soils, on south-facing to northwest-facing slopes, and at least 750 feet away from streams. My group of six to seven people split up work among the five maps, marked desired regions on each map, then looked for commonalities. We were eventually able to find five sites that met most or all of the conditions. It was challenging and fun to compare many maps and communicate effectively with my group members. After the hands-on activity, we discussed some of the challenges. 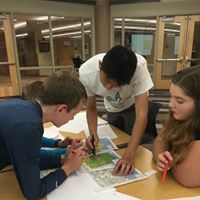 Many of us found it hard to identify overlaps between maps because we had paper copies, but GIS software such as ArcGIS can make it much easier to work with maps. This discussion brought up Jen’s follow-up lab in December, which will be an intro to ArcGIS at a computer lab. Finally, Jen showed us a few examples of cool maps that are good examples of rich data. I enjoyed interacting with my peers at this café and left with a new appreciation for maps and the role they play in our everyday lives.